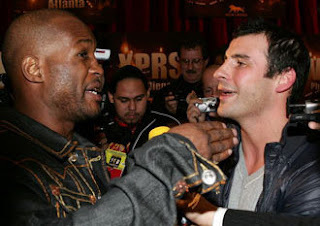 april 19, undefeated and undisputed super middleweight champion joe calzaghe wil face former undisputed middleweight champ, and the ring light heavyweight champion bernard hopkins in las vegas. if you haven't heard of calzaghe, i blame you not as this guy made a name for himself in the uk. while hopkins ridicules calzaghe's opponents, no one can deny that calzaghe's going undefeated in 18 years is impressive. in fact, it's even more impressive than the rockets' longest winning streak. hopkins is 43 years old and looks like 43. he may have had beaten winky wright but this does not make him any younger. while calzaghe is not young at 36, the pride of welsh will have the upper hand in terms of youth. experience-wise, calzaghe is not far behind hopkins. phoenix suns: making history with a comeback? benny the bull to be sued over "flagrant foul"
kobe "jumps over an aston martin"